Plasma Skin Tightening (also called Fibroblast) is a low-risk, minimally-invasive cosmetic treatment that eliminates excessive or sagging skin and improves the tone and texture of the skin. It is a less expensive and safer alternative to invasive cosmetic surgeries (such as eye lifts, brow lift or tummy tucks), but it’s just as effective with much less downtime. Plasma Skin Tightening can also be used to remove skin tags and improve the appearance of stretch marks and acne scars. Although Plasma Skin Tightening is not surgery, it delivers similar results. It’s a win-win-win (cheaper, safer, less downtime) over plastic surgery. Plasma Skin Tightening (also known as Plasma Pen Treatment or Fibroblast Skin Tightening) is the only cosmetic treatment to use electrical arcing to eliminate excess skin. 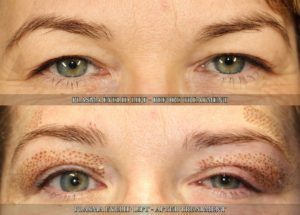 It is known for its success with non-surgical eye lifts, scar lifting treatments, wrinkle reduction, tummy tightening and so much more. The term “soft surgery” is often used to describe the treatment because it delivers results similar to surgery without a scalpel, stitch or bandage and minimal downtime. It is a minimally invasive procedure with a much lower risk and at a more affordable price than actual surgery. 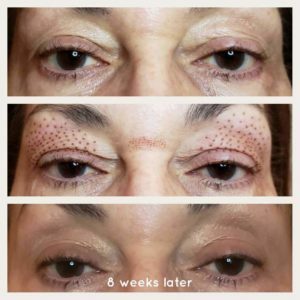 Fibroblast Skin Tightening is a relatively new innovation in the beauty industry. The extremely accurate device works by utilizing the voltage in the air between its metal tip and the skin, to form an electrical/plasma arc. This electric/plasma arc instantly shrinks the targeted skin, causing tissue retraction and tightening, giving results that are comparable to invasive surgery by physically reducing the volume of skin in the surrounding area. The sublimation leaves behind a tiny carbon dot which will shed off the skin naturally in about 5 to 7 days. The skin around the carbon dots, due to the massive boost in collagen, firms and tightens and the new skin that forms below the dots is soft, firm and tight as well. The effects of the plasma lift do not revert. It’s not like botox where it wears off and you need to repeat the same procedure every couple of months. 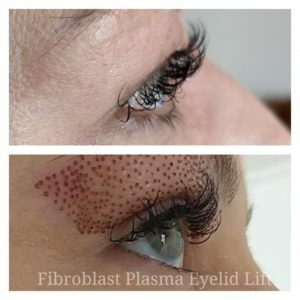 The results of the fibroblast tightening treatment are as permanent as surgery. You will continue to age but the effects or results of the ‘soft surgery’ become your new starting point for your aging process. On the day of your appointment, we recommend taking an non-drowsy antihistamine 30 minutes prior to your appointment time. This will help with any swelling that you may experience. You can also continue to take antihistamines for swelling a few days following your treatment. A numbing agent will be applied to the areas that will be treated. Beauty Lounge Practitioners will use the hand-held device on the targeted area. You may feel some heat, which may be uncomfortable and slightly irritating. Immediately after treatment, the area will be red and mildly swollen with some discoloration (tiny brown marks that look like scabs), however you will see results immediately. The area may feel like it’s been sunburned, this feeling may last a few hours post-treatment, and the swelling may intensify and last up to 2-3 days. The eye area usually experiences to most swelling. All side effects should subside within 5 -12 days depending on the individual and area treated and the results will also improve over the course of 6 weeks. You will be provided with aftercare instruction to ensure best results. For most people, driving immediately after the treatment is fine. However, if your eye area was treated, it may be best to come with someone that can drive you afterward. This procedure usually takes 10-40 minutes, depending on the size of the area being treated. You will more than likely see immediate results from the procedure. Sometimes redness and swelling can occur which can distort the results, but you will be able to see special results right away. 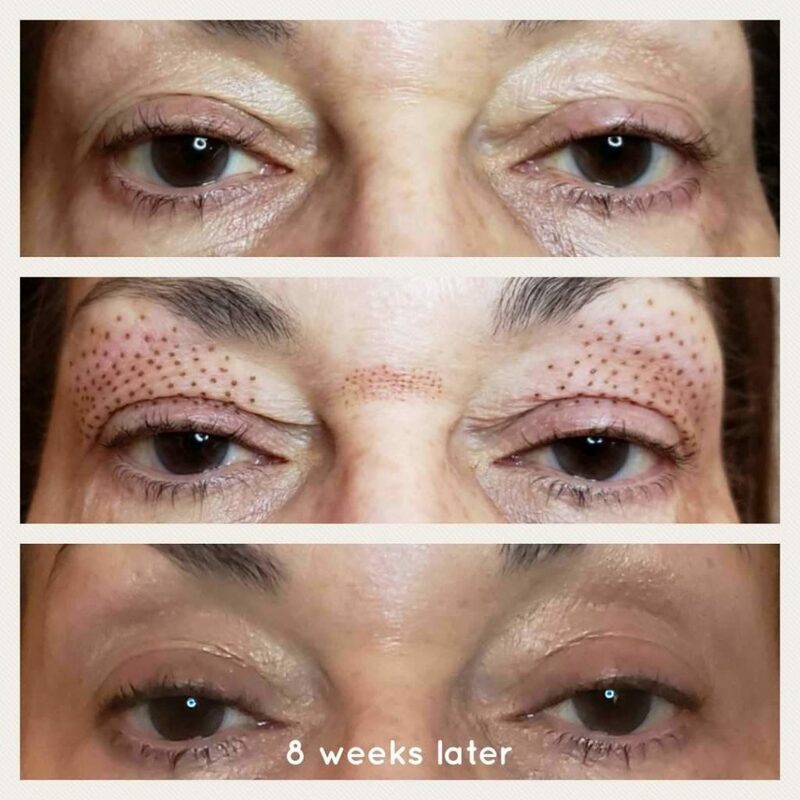 You will notice more firmness and tightening of the treated areas as the skin continues to heal and produce more collagen (sometimes even 3-6 months later!). Following treatment, it is normal to have some swelling. This can be significant around the eyes and can last for several days and may lead to interference with vision in the initial period. Cold compresses may be applied to reduce the swelling. If the swelling is more severe, an anti-inflammatory medication and/or anti-histamine may help alleviate the swelling. Crusting will usually develop over the treated area, this will often initially be brown or black on the surface of the skin and flake off over the following days. It is essential to not pick at this crusting as this may lead to infection or scarring. Occasionally the treated area may become a little weepy, this is part of the normal healing process and will improve with time. It is very important to follow our after care recommendations. Carbon crusts CANNOT be scratched or removed. Drying skin by dabbing with a clean, lint-free cloth is allowed. Sports, swimming and sauna are not permitted until crusts fall off. SPF 50 must be used on the treated area for a minimum 30 days after treatment. 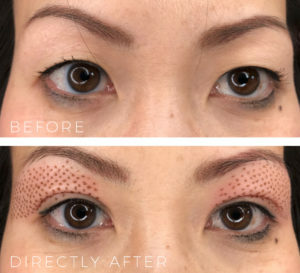 CAN I USE MAKEUP AFTER THE PROCEDURE? The treated skin area will be covered with carbon crusts which form during the treatment. They should not be rubbed off therefore it is necessary to avoid any moisturizing creams for 5-10 days. It is recommended you avoid any makeup on the treated area for at least 2 weeks to let the skin breath and heal. In addition, patients need to avoid all direct heat sources such as sun, UV radiation, saunas etc for the period of at least 4 weeks. ARE THE EFFECTS OF TREATMENT VISIBLE RIGHT AWAY? Most patients should notice the effect of the procedure right away. However, the healing will continue and the full result should be visible up to 8 weeks. In some cases patients may need more then one treatment. This depends on treatment area and skin condition as well as patient’s expectations. There will be some tiny brown marks that have the appearance of minor scabbing, which are carbon crusts, but in 5-7 days these will flake away, revealing new pink skin beneath. Some swelling will be seen (especially in cases of eyelid treatment), but it is likely to only last 3-5 days at most. To avoid any more serious side effects such as hyperpigmentation, follow the aftercare recommendations given to you by your technician. STRETCH MARKS: $500 to $1000, depending on length, width and quantity. SKIN TAGS: starting at $50 increases with number of tags removed. MOLES: starting at $50, increase with number of moles removed.